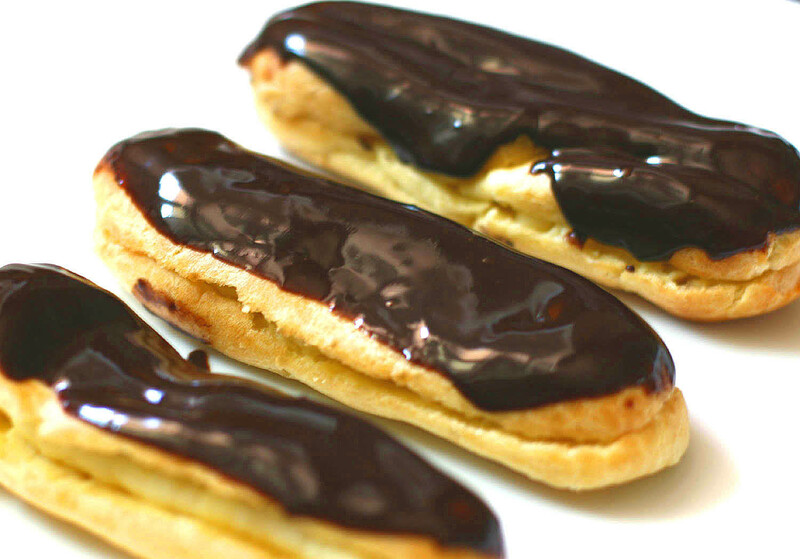 i thinks eclairs are absolutely the best that there is in pastry. Good eclair is worth every inch on your hips, every agonizingly guilty second after the consumption, every extra step on the treadmill. However, in my opinion, you'll be hard pressed to find a decent eclair in Dallas. I mean there are bakeries that try, but they just can't deliver. No offence, but "french-y" La Madelein's eclairs are anything but what a good old fashioned eclair should be - first of all, they are "Texas sized", secondly their pastry shell is often hard, and thirdly their filling is gritty and just not up to my standards. The best eclairs are to be had, of course in France. That's like an eclair paradise, heaven, Shangri-La. I never had a Lenotre experience though. Mostly, because prices at this famous bakery is not for the faint of heart; i mean they were triple the price for the same gorgeously decadent, mouthwatering eclair that i could buy at the neighborhood pastry shop on rue Cler. But now, in Dubai i can have me a piece of Lenotre eclair and eat it! There are 2 locations, i think, in this city; unfortunately, the 3-rd one is being closed down. First of all, american macaroons are not really macaroons at all. American macaroons are basically your dome like spoon-drop cookies with coconut shreds sticking out of it. I don't now why are they called macaroons. I imagine, french people have mild heart attack every time they lay their eyes on american macaroons. Secondly, i never had a fever for macaroons. I know a lot of people are absolute nutters when it comes to real macaroons, but this particular pastry is not for me. Actually, i never had one until i came to Dubai. See, i was too concentrated on eclairs in Paris, that i didn't even want to spoil my epicurean intimacy with them by trying something unknown. Yeah, silly of me. But such is my unwavering love for eclairs. Anyways, my first experience with macaroons happened here in Dubai. The biggest mall in the world (that's Dubai Mall) just happened to open resurrected version of long forgotten famous Parisian bakery Forrey and Galland. I don't know how close it is to the real thing, what with the original store in Paris being shut down for ages and originally spelled FOUREY/GALLAND, but inside it's very fancy. I mean the guy, who is handling the counter and the pastry display is wearing a white glove on his right hand, for Pete's sake! So i tried a pistachio macaroons there and let me tell you, that thing was NOT TASTY. It had a chewy shell, or whatever it is called in macaroony world, and it's filling had an unintelligible taste of something similar to cardboard. Not good and not worth the hassle. But maybe, just maybe, i should give macaroons the second chance at Lenotre?